When an earthquake strikes, it is not just the immediate loss of life that is a concern, but the longer-term damage to critical infrastructure and the effect on human survival. As we know, water is critical to every living creature, and in an earthquake, when there is damage to the water infrastructure, such as the underground piping, people can be left without this basic life-sustaining commodity. When traditional solid cast-iron piping is used, an earthquake can cause these to deform and buckle. However, with a new ductile pipe design by Japanese company, Kubota--the pipes are built in a chain-like fashion and expand and contract, flex and bend, but do not easily break. According to the Wall Street Journal (14 April 2011), Kubota earthquake-resistant pipes even withstood the 9.0 quake in Japan in 2011, and it can withstand "shaking, landslides, and extreme temperatures. 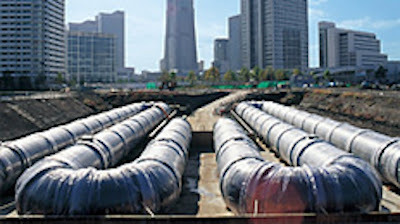 Now Los Angeles is piloting this pipe along 2 miles of its 7,000 miles of piping--they are focusing on "the most vulnerable, fault-line-adjacent areas," since the piping is 2 1/2 times the price of regular piping. In the absence of having a device like the Star Trek Replicator to synthesize food and water on the fly, it makes a lot of sense to upgrade our water systems and other critical infrastructure to protect us from the disasters that come.